GDPR: What is It and How Does it Impact My Business? What is GDPR and what does it stand for? The new EU regulation has affected businesses worldwide. In this article, we explain the what, the how and the why of the new EU privacy law. What are the business implications of GDPR? How will your business, whether based in the EU or not, comply with the long list of “articles” under GDPR? GDPR will affect the way you communicate, but how? The way you handle personal data has now changed, and this applies to both prospect and customer data. The internet has dramatically changed the way we communicate and how we handle everyday tasks. We send emails, we share documents, we pay bills and we purchase goods by entering our personal details all online and without a second thought. Have you ever stopped to wonder how much personal data you have shared online? Or what happens to that information? We’re talking about banking information, contacts, addresses, social media posts, and even your IP address and the sites that you’ve visited are all stored digitally. Companies tell you that they collect this type of information so that they can serve you better, offer you more targeted and relevant communications, all to provide you with a better customer experience. But, is that what they really use the data for? This is the question that has been asked and answered by the EU, and why in May 2018 a new European privacy regulation called GDPR was enforced and permanently changed the way you, as a business, collect, store and use customer data. In a study of more than 800 IT and business professionals that are responsible for data privacy at companies with European customers, Dell and Dimension Research found that 80% of businesses know few details or nothing about GDPR. 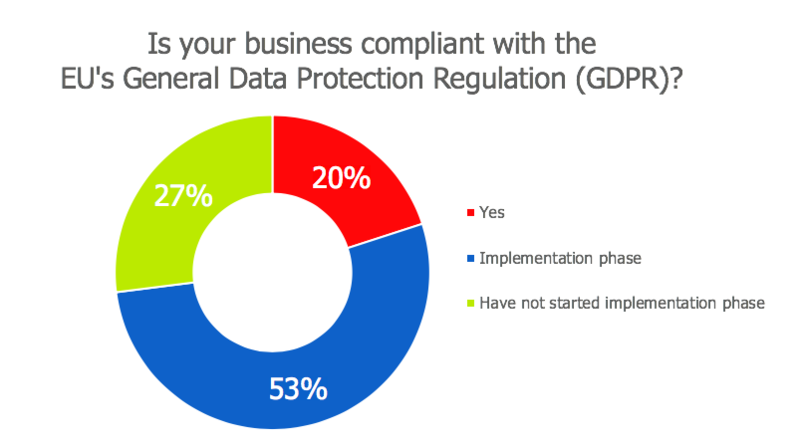 Recently, TrustArc found that only 20% of businesses believe they are now GDPR complaint. More than 1 in 4 companies (27%) have yet to begin work on making their organization GDPR compliant – several months after the May 25th deadline has passed! it’s easy to understand if a small brick and mortar store found it difficult to prepare for GDPR, but research from The Ponemon Institute found that 60% of tech companies weren’t ready either. So, it’s not just small “non-techy” businesses that are behind with GDPR! So, whether you’re in tech, travel, retail or an entrepreneur, we explain what GDPR is, how it will impact your business and include practical tips on how you can prepare for GDPR compliance. On May 25, 2018, the new European privacy regulation came into effect. This regulation has been implemented in all local privacy laws across the entire EU and EEA region. It will apply to all companies selling to and storing personal information about citizens in Europe, including companies on other continents. What GDPR means is that citizens of the EU and EEA now have greater control over their personal data and assurances that their information is being securely protected across Europe. According to the GDPR directive, personal data is any information related to a person such as a name, a photo, an email address, bank details, updates on social networking websites, location details, medical information, or a computer IP address. There is no distinction between personal data about individuals in their private, public or work roles – the person is the person. Also in a B2B setting, everything is about individuals interacting and sharing information with and about each other. Customers in B2B market are obviously companies, but the relationships that handle the business topics are people – or individuals. The right to data portability – Individuals have a right to transfer their data from one service provider to another. And it must happen in a commonly used and machine readable format. The GDPR is the EU’s way of giving individuals, prospects, customers, contractors and employees more power over their data and less power to the organizations that collect and use such data for monetary gain. This new data protection regulation puts the consumer in the driver’s seat, and the task of complying with this regulation falls upon businesses and organizations. Otherwise, you’re failing to comply. What falls under GDPR compliance? Well, GDPR applies to all businesses and organizations established in the EU, regardless of whether the data processing takes place in the EU or not. Even non-EU established organizations will be subject to GDPR. If your business offers goods and/ or services to citizens in the EU, then it’s subject to GDPR. All organizations and companies that work with personal data should appoint a data protection officer or data controller who is in charge of GDPR compliance. There are tough penalties for those companies and organizations who don’t comply with GDPR fines of up to 4% of annual global revenue or 20 million Euros, whichever is greater. Many people might think that the GDPR is just an IT issue, but that is the furthest from the truth. It has broad-sweeping implications for the whole company, including the way companies handle marketing and sales activities. The conditions for obtaining consent are stricter under GDPR requirements as the individual must have the right to withdraw consent at any time and there is a presumption that consent will not be valid unless separate consents are obtained for different processing activities. This means you have to be able to prove that the individual agreed to a certain action, to receive a newsletter for instance. It is not allowed to assume or add a disclaimer, and providing an opt-out option is not enough. GDPR has changed a lot of things for companies such as the way your sales teams prospect or the way that marketing activities are managed. Companies have had to review business processes, applications and forms to be compliant with double opt-in rules and email marketing best practices. In order to sign up for communication, prospects will have to fill out a form or tick a box and then confirm it was their actions in a further email. Organizations must prove that consent was given in a case where an individual objects to receiving the communication. This means that any data held, must have an audit trail that is time stamped and reporting information that details what the contact opted into and how. If you purchase marketing lists, you are still responsible for getting the proper consent information, even if a vendor or outsourced partner was responsible for gathering the data. In the B2B world, sales people meet potential customers at a trade show, they exchange business cards, and when they come back to the office, they add the contacts to the company’s mailing list. In 2018, this is not possible anymore. Companies will have to look at new ways of collecting customer information. A key component of the GDPR legislation is privacy by design. Privacy by design requires that all departments in a company look closely at their data and how they handle it. There are many things a company has to do in order to be compliant with GDPR. If you have yet to to take the next step towards compliance, here are just a few ways to help you get started. Map where all of the personal data in your entire business comes from and document what you do with the data. Identify where the data resides, who can access it and if there are any risks to the data. This is not only important for GDPR, but will help improve Customer Relationship Management. Don’t keep more information than necessary and remove any data that you aren’t using. If your business has collected a lot of data without any real benefit, now is the time to consider which data is important to your business. GDPR encourages a more disciplined treatment of personal data. Why exactly are we archiving this data instead of just erasing it? Why are we saving all this data? What are we trying to achieve by collecting all these categories of personal information? Is the financial gain of deleting this information greater than encrypting it? Develop and implement safeguards throughout your infrastructure to help contain any data breaches. This means putting security measures in place to guard against data breaches, and taking quick action to notify individuals and authorities in the event a breach does occur. Make sure to check with your suppliers also. Outsourcing doesn’t exempt you from being liable and you need to make sure that they have the right security measures in place. For example, the recent data breach for companies using third party survey provider, Typeform. 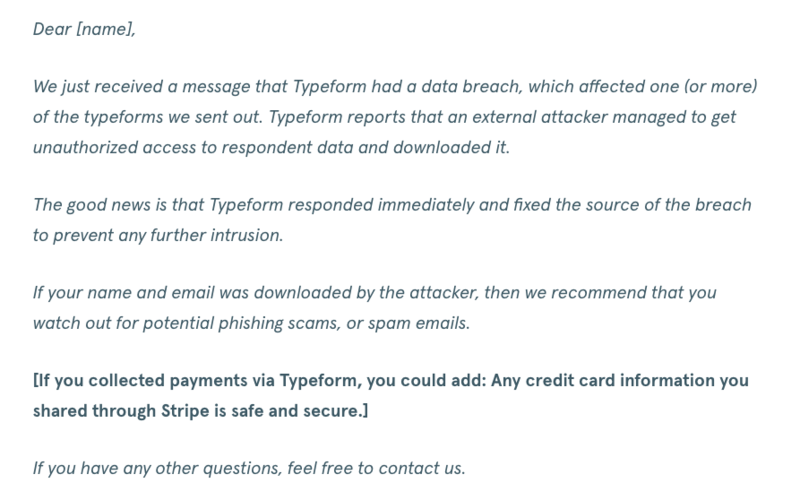 Typeform were quick to communicate the data breach and included a template for their customers that used their software to collect personal information (as shown below). Under GDPR, individuals have to explicitly consent to the acquisition and processing of their data. Pre-checked boxes and implied consent will not be acceptable anymore. You will have to review all of your privacy statements and disclosures and adjust them where needed. As we mentioned earlier, individuals have 8 basic rights under GDPR. You now need to establish policies and procedures for how you will handle each of these situations. How can individuals give consent in a legal manner? What is the process if an individual wants his data to be deleted? How will you ensure that it is done across all platforms and that it really is deleted? If an individual wants his data to be transferred, how will you do it? How will you confirm that the person who requested to have his data transferred is the person he says he is? What is the communication plan in case of a data breach? Data is a valuable currency in this new world. And while GDPR does create challenges and pain for us as businesses, it also creates opportunity. Companies who show they value an individual’s privacy (beyond mere legal compliance), who are transparent about how the data is used, who design and implement new and improved ways of managing customer data throughout its life cycle build deeper trust and retain more loyal customers. When first announced in 2016, it felt like there was plenty of time for new businesses to take the necessary steps. But, this time has flown by and many companies are still scrambling, even after the deadline has passed. So, if you haven’t already started your journey to compliance, we urge you to start now. Dedicate time to understand what you need to do in order to become compliant and use the practical tips shared in this article to help you get started. Then, create a plan of action for your journey to GDPR so you can ensure you and your business are complaint sooner, rather than later. P.S. If you’re interested to know more about how GDPR affects your customer data, then contact us today. Jennifer Lund is the Chief Marketing Officer (CMO) at SuperOffice. A strong believer in the synergy of branding and marketing as the cornerstone of a successful business strategy, Jennifer is passionate about taking the company’s brand identity to new heights, by focusing on how the application of the brand and modern marketing trends can elevate the overall customer experience.You can connect with Jennifer on Twitter @jenniferlund. Thanks for sharing such useful information about GDPR, It gave me ideas for customer retention. Nice write up on GDPR. Thanks for this comprehensive information. Loved it! If a company holds a private contact list which is only used when there is need to contact an individual, does this come under the GDPR regulations? The list is held digitally but is not used for any marketing purposes or automatic processes. Despite looking I can find no reference to private lists and you thoughts would be helpful. Great question, Debbie! If your private contact list includes customers, then it should be compliant with GDPR. But if they are not customers, you will most likely still need to get their consent to store the data. Thanks for commenting, Usama. Great question! I would suggest speaking with your clients to see what steps they are taking towards becoming GDPR compliant. From 25 May 2018, the EU GDPR (General Data Protection Regulation) will affect every organisation that processes the personal information of EU residents. A really interesting and insightful blog post. Tens of thousands of organisations around the world are facing a major upheaval in the way they process data. Complying with GDPR is not straightforward. It will require detailed planning and collaboration with all the businesses in your chain. Well said, Vicki! Thank you for contributing with your comment. Our cricket association holds members email addresses as well as mobile numbers. Will come under GDPR ? Thanks for the comment, Peter. Do you have consent that their information is stored? How about old contact information for current/former customers and/or sales contacts (from trade shows)? Will we need to send a mail out to each of them to confirm they know they are in our CRM system or will GDPR only apply to new contact information loaded? Hi Anna. For customers, you should be OK, but for sales contacts, I recommend reaching out to them to gain consent to store their data. GDPR affects both new and existing customers. As a small, specialist executive search company handling a small number of assignments per year, what permissions do I need to obtain? Firstly in respect of prospective candidates' cvs that are submitted to me for consideration in respect of a particular vacancy, or generally for consideration of future opportunities. Secondly, in respect of client contacts/prospects. Hi John, thanks for the comment. You will need to get consent to store any prospect or client data. Hi Olivia. As far as I am aware, you do not need consent to market to clients outside of Europe. Telephone and email lists of internal contact details provided by a customer - are these consent free under GDPR? Is it feasible that individuals can request removal, when they are a fundamental contact point to answer any question to enable contractual obligations to be managed? Hi John. Any individual can request removal of their data, but when their data is tied to a contract it can be a challenge. You could always request a the contract be transferred or try to anonymize the data. We have a field sales team, all of whom have mobile phones and laptops containing various customer and prospect information (contact details etc) - will they need to seek permission before this data can be stored? What about prospects? Hi Jonathan. For customers, you should be OK. For prospects, I recommend reaching out to them to ask for consent to store their data, just to be sure. Hi. I understand that for new/future contacts we physically need an individual to opt in - how does the new legislation apply to contacts we already have stored? The initial sign up form for these contacts had a clause at the top along the lines of 'By giving us your details you agree for us to contact you and to keep you informed about our products. We will not pass your details on to any third party.' - but no actual opt in tick box. The email communication also had an unsubscribe link. Can we continue to use these contacts or do we have to regain opt in permission? Thanks. Hi Beth. If you have previously sent marketing communications to your prospect list, then you do not need to reconfirm their opt-in - providing there has always been an option to opt-out of further messages. How will GDPR affect direct postal mail shots from pre purchased mailing lists? Does consent have to be re-obtained by the company who has purchased a list before any customer interaction can begin? Good question, Debbie. To be honest, I'm not sure how GDPR affects direct mail. Excellent content regarding GDPR. In this world based on data, GDPR plays an important role in protecting and securing it. Nice post! Hi Jennifer, Thanks for providing such informative post about GDPR - it really helps business owners who are preparing their business across globe for the May 25th deadline. Hello Very informative thank you Someone asked the question about using the details from a business card as not consent. Would the same apply to an email , i.e if Bert forwarded a Freds email details to someone else for the purpose of recommending that person as a potential customer or lead for him to follow up , this would need consent from that contact yes ? Hi Mark. In this case, I recommend speaking to the person on the phone first before you store their details. Great comments Steven and responses. We have a 20 year old database with thousands of contacts, 75% prospects, and a team of cold callers / warm callers etc, as is typical with many companies. Will we still be able to email them and make cold calls? Or is the whole point that they need to opt in for us to do this. Thanks, JP! If people on your list have already received email campaigns from you in the past, then it should be OK to continue sending them under GDPR. But, I would suggest that you offer those who haven't received an email in the past the chance to opt-in for future emails. Hi Steven, thank you for many good responses here. I think we all are very uncertain on how to behave towards non-customers. We are a software company with a few customers and even more prospects. The prospects have been found using different products like LinkedIn etc. We have sent "cold e-mails" to these, and some of them have responded and are interested / semi-interested in our products. These are now stored in SuperOffice, but can we keep them? Or should we send them an e-mail telling we have stored them and they need to give us their consent? Hi Rikard, thank you for leaving a comment. Yes, there's a lot of uncertainty around GDPR! Cold emailing is fine, so you can continue to do this. Thank you Steven for your clarification. This raises another question; You say Cold e-mailing is fine, but storing the prospects for these cold e-mailing is not fine? Or would you say we can store them but we should delete them after a certain amount of time? Hi Steven, very informative with some extremely helpful questions and replies. Thank you. With the deadline looming, I'm still unsure as to my next steps re. GDPR compliance. I run a Ltd. company, a Learning & Development consultancy, working both directly through my company and as an Associate for others businesses e.g. training brokers. My company employs only me. I hold current and past customer contacts along with business address, email and telephone details. That's all I have. The contacts reside on my PC and Mobile Phone and not in the cloud. Your thoughts on where I stand with GDPR and the need to obtain consent from current and past customers would be appreciated. Hi David, thanks for commenting and I most definitely understand your concerns here. Providing customer data is stored securely and that if any former customers ask you to remove/ delete their data and you can prove you have done it, then you should be fine to continue the way you do today. Hi Steven, we can still continue doing "cold e-mailing" but we can't store the prospects in SuperOffice without their consent? Can you explain a little more around this? Thank you for your help! Hi Steven, Very informative article. I do have a few questions: We are a small company in the EU with 15+ employees and have about 6 remote employees in and around other non-EU countries. - How will GDPR impact us due to this? - What will our (company's) role in GDPR be towards our customers? - Is it a problem with having employees/contractors outside of EU? - What steps should we take to incorporate GDPR in the company and work with EU and non-EU companies and contractors? Hi Natasha, thanks for commenting. As these GDPR-related questions are very specific to your business, I recommend that you speak with a lawyer. They can provide you with the answers you need. Hi We are a freight forwarding / shipping company. We process requests to ship goods all over the world. We only collect name, address and number of the shipper and the name address and number of the receiver. This data is then obviously given to the shipping line and import export. Do we have to record this information and especially the outside EU companies and ports how do we make sure they are complying with the GDPR as it is not there legal system - if they do not comply does that mean we can not longer use them for shipping or import export offices? Great question, Tammy. I suggest you speak with a legal team on this one. Hi Natasha We are in the same position. We are a freight forwarders and shipping company so we collect name and address of who we ship for and the details of who we are shipping to and these are in countries all over the world. Obviously we have to share these details with customs and the shipping lines- but like your company they are not in teh EU so how do we make sure they are being compliant with the data we have handed over. We are processing data of people with in the EU so we have to conform but no idea how?? In our business a number of people use their contacts on their business phone to include personal contacts as well as customers and suppliers. Do we need to do anything about these personal contacts? Hi Tony, thanks for leaving a comment! Can you share a few more details here? Not sure I fully understand the question. Hi I am self employed and run an extra tuition service. Parent's details are on my phone in text messages and in a paper based filofax. I lease a photocopier to copy work and books for the kids but the company is telling me i need to pay £60 a month or a new security device on the copier for it to ensure im compliant but I do not use it to process personal details- I scan maths work and send it to the hard drive of my laptop or photocopy books. Please advise as they are saying I need to pay it or I will be fined? Thanks! Hi Emmy! Great question. To be honest, I'm not sure how to answer this, so I suggest you speak with a lawyer, just to be sure. Hi Manny. Good luck, and I hope things work out with your job. GDPR will touch on more departments than just HR. For example, GDPR heavily impacts sales and marketing teams too. Enforcement of GDPR is for sure going to have a huge impact on the business industry. To comply with the laws and having a proper contingency plan at a place will prove to be effective. This is quite an insightful article covering all the basic requirements of GDPR. Hi Tracey! I understand your concern. GDPR impacts all businesses, but to varying degrees. I suggest speaking with a lawyer, just to be sure given your unique circumstance. Hi. Small businesses pay me to promote their businesses on several websites i own. Their details eg shop name, sector and relevant links are promoted on the sites, i dont store any other info about them or sell their info on...how does gdpr affect me when selling an advert to a new customer? Hi Steve. If you do not collect personal data, then you should be fine. We do work on behalf of a trade union, for "members" who pay us a fee to do manage activities on their behalf. We email them to discuss the work, to send reports about the work we do, and to send invoices. We don't sell anything so we don't market anything. Must we get permission from the email owners to use their email address/phone number in this way? Hi Chris. Thanks for leaving a comment. As long as you do not store personal data, then the way you work will most likely not change. Hi Steven, I see contradictory information around the internet about whether existing contacts need to give consent or not. Are you able to point to the part of the GDPR that stipulates that it is not necessary to obtain consent from existing contacts? Would be worth writing a separate article on data controllers/processors and how to get GDPR ready as this is a bit fuzzy field. Great article. Keep up the good work! Hi Forina. Yes, I think so, but I recommend seeking legal advice, just to be sure. Hi Steven, Thank for the info on this issue. We are a US company that stores the business email addresses/phone numbers of employees of our EU customers for contact regarding purchasing and accounting issues. Am I correct in assuming that we don't need to request consent from these people since they are existing customers? Hi Kathy, yes you should be fine seeing as you're talking about existing customers. We are using an order form, a contact us form and a comment section where we take user information like email, name etc. So do we have to provide withdrawal option in all these pages if user wants to delete his/her data from our records? If yes then how will we keep record of our orders? You don't need to include a withdrawal option, Ammar. Withdrawal can be included in your email campaigns via an unsubscribe link. Thanks, Ammar. Maybe you can include a new form on your website that is only used for withdrawal requests? 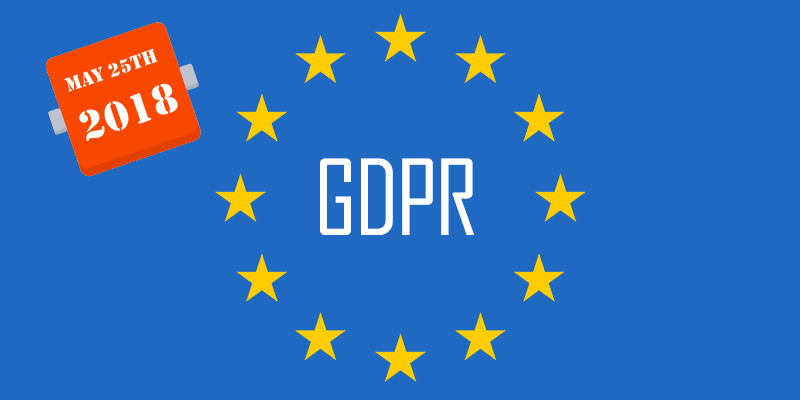 The General Data Protection Regulation (GDPR) represents EU's 'consumer-first' commitment and endeavor to tighten data privacy control, safeguard the rights of individuals, and establish trust between consumers and organizations. There are eight guidelines that GDPR mean for businesses within and outside European Union. Obtain consent, ensure rights of individuals, demonstrate accountability and much more. A data protection officer (DPO) is an enterprise security leadership role required by the GDPR. DPO's are completely responsible for data protection and privacy in their organization. I think that would be a good idea, Ammar. Hi, We are a US company with a UK subsidiary that has 2 employees. Both of their employment contract includes a standard clause: Subject to your rights under the Data Protection Act 1998, you consent to the processing of any data relating to you, in particular, to the processing of any 'sensitive personal data' (as defined in the Act) relating to you and to the transfer of any personal data to any Group Company located outside the European Economic Area. Does this constitute consent to storage of there personal data (for purposes of payroll)? Hi. Unfortunately, I'm not sure about this. Have you spoken with your legal team? Hi, as IT consulting company we do not process personal data, but we do have contact information (email address, phone number, etc.) of counterparts at customer companies in EU. We do not use their contact information for marketing purposes, but for daily communication about projects and so on. Are we affected by GDPR? Thanks for the comment, Quera! You might be affected by GDPR, yes so I recommend speaking with the legal team or DPO at your company to see how exactly it will be impact you. Thanks for commenting, Tim. If you store any information on your customers - even if it's as simple as a delivery address - then GDPR applies to you. Hi, I run a home-visit computer repair service (no employees) so I hold Customer’s name, address and telephone numbers in my phone. Do I need to ask my customers again for permission to keep these details? Hi David, you should be fine. The GDPR impact is different for customers, compared to prospects. Thanks Steven, I presume by your answer that there is nothing I need to do? You're welcome, David. That's right, you shouldn't need to do anything. Thanks for commenting, Arunas! To be honest, I'm not sure. Have you spoken with a lawyer about this? Hi Sue, that's correct. You do not need to gain consent from existing customers, but you should always provide a way for them to opt-out of marketing messages should they wish to do so. Unfortunately, I haven't come across any small business templates. Hi Diane, thanks for leaving your comment. Seeing as all of your communication is related to customers, then you are fine to continue doing what you're doing. Hi, for retaining proof of consent, the article mentions a time-stamped audit trail with information about what the contact opted into and how. As far as I'm aware, this includes the opt-in form itself, which represents quite an overhead for businesses, especially those with multiple forms, those who are split testing forms and so on, and for the audit trail you have to be able to link a particular form to a particular lead on your list. You can either try doing this manually with time-stamped screenshots of forms, which doesn't sound too sustainable, or using a service like optinopoli which records forms automatically each time a lead opts in. That's a great point, Steve. 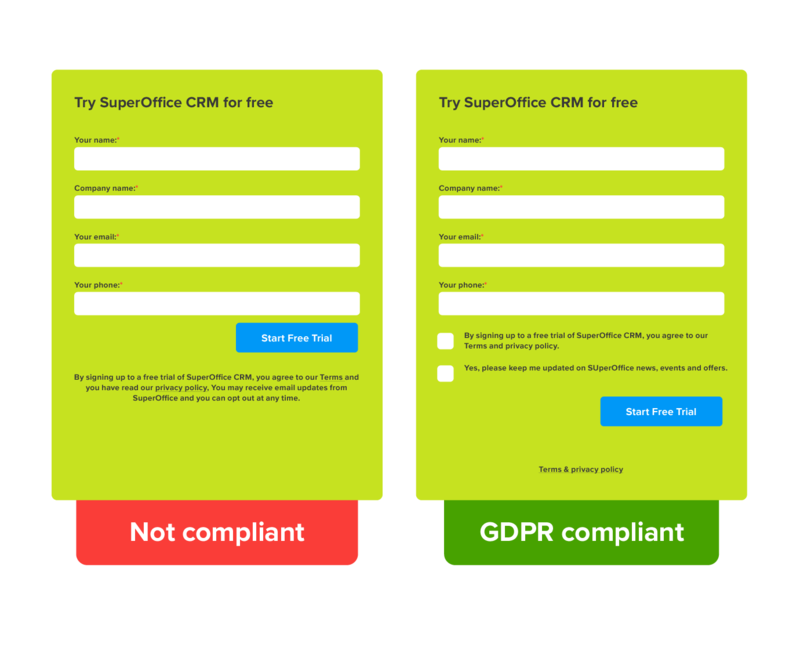 I recommend signing up for a demo of SuperOffice as our web form solution should solve most of, if not all, the challenges you mention. Hi Steven, I ran a small ecommerce website. If I delete my customers addresses, mobile numbers and email addresses as I don't need it, do I still have to be GDPR ready. I mean once I sent them their item I delete the contact details. I don't have legal team. My business is just me. Should it be fine in your opinion? Thank you for your answer? Hi Kasia, you don't need to delete any customer data, as you have a legal basis for storing their information. Thank you so much Steven for your reply. I am struggling with that new regulations. So is that mean that if I don't use their data in any purposes I am fine with GDPR? Yes, if you're speaking about existing customers, then that's correct. Hi, I am running a free vector converter. Do I have to do GDPR for this website? The images and photos uploaded by people on this website aren´t used for anything and the files are automatically deleted after 1 hour from server. The website doesn't work with any other data besides images (no emails, no cookies etc...). Hi Ivan, thanks for your comment. As long as you do not process personal data, then you should be fine. One of the reasons businesses are not prepared for the new guidelines is that they don’t think it will affect them; for example, because they don’t process or hold much data, they assume they’re exempt. But the important thing to remember is that every business that has dealings in the EU must adhere. The article is really needed at this time and the details stated in the article are good and well knowledgeable. It clearly describes the effect of GDPR in the world business market. Because of GDPR, every business has ensured themselves and appointed a data protection officer of their own to inform stakeholders about the charge prompted by GDPR. Thanks for sharing. Great article. We are a US-based manufacturer who does not sell direct to consumers, we are a co-packer/contract manufacturer that produces product for customers who reside in the Netherlands. Their products potentially go to consumers in the EU. Does GDPR impact our business? Thank you! That's a great question, Kelly. If you store data on customers that are based in the Netherlands, then GDPR does impact your business. I need to write an article on GDPr for my clients (as none of them seem overly bothered about GDPR - even though its been plastered everywhere for a long time!). I found this very helpful, thanks! Hi Steven, what if my company collects name, email address, plus other non-personal data (number of total attendees at event, number of people that need hotel accommodations, number of people with food allergies). My company only retains the numerical information and deletes name and email address. Does this render us not subject to GDPR? Good question, Dawn. I'm afraid I'm not sure how to handle this. Have you spoken to a legal team? GDPR is a very important strategy for Business. It clearly describes the effect of GDPR in the world business market. Thanks for sharing your wonderful thoughts. Thanks, Gaston! Glad you found our article on what GDPR means useful. Pretty good article. GDPR enforcement had been for the good so as to protect private data. Thanks for this great article - GDPR is an important strategy for businesses! Thanks, Louise! That's a great question! If the cabinet is securely locked, then I assume it's OK. However, I would recommend digitalizing your customer records into a CRM system. Very interesting article! GDPR for sure should be seen an opportunity for businesses to improve their processes and systems. One of the challenges I see is that companies have a hard time finding all the personal data that lies around the company. Without the overview, it becomes risky to be compliant. That's so true, Nina. You are right! General Data Protection Regulation, is a new set of consumer privacy regulations. These rules regulate how companies can collect, store, maintain and share their customer's personal information. we have about 90 boxes of paper work with a storage company - they charge us a fixed fee every year, just received their invoice and they have added an extra £180 for GDPR charge - is this correct/allowed ? Hi Maxine. I'm sorry to hear that! I recommend you seek legal advice here, as I'm not sure if that is allowed or not. Hi JP! Great question! Unfortunately, I don't have an answer for this, so I recommend contacting someone on your legal team. Hello, Our company created account for users, so normally when leave the company the we could still have a copy of the data, then when they resigned usually they will handover work to their replacement staff, however could we still forward resigned user emails to the new staff and actually share back all his mails history he has for follow up? or GDPR Still apply need his written consent. If it is the case I was just wonder whats the point of company investing so much money to make their own mail server if we cant retrieve data that concern our company. Hi J. Great question! When it comes to internal business email correspondance, then this should be fine. Greetings, Absolutely amazing stuffs here. For a non EU company that offers a third party software that assist different organizations to collect personal information some of which could be from EU citizens, without storing the information. are we affected by the regulation. Glad to hear, Ali. Thank you! I feel you are affected by GDPR, but just to be sure, I recommend you speak with your in-house legal team. Hi. A question.I have to advise a new client with a new business on email marketing. They were formed post the GDPR deadline and have a considerable number of contacts gathered from business cards collected through B2B networking events. Given you are not allowed to contact anyone without permission post 25 May 2018, apparently even to ask for permission, how are they to move forward in terms of advertising their services via an email campaign to those they met? Hi Keith, thanks for asking a great question! I believe the best approach here would be to call each person individually, remind them why you're contacting them and how you met and then at the end of each call, ask them if they would like to receive company news and updates by email. Hi Steven. Thanks for your answer. Even some emailing companies cannot get their heads around this one. There is a post GDPR as well as a pre GDPR world. Life does go on - and there is not a lot of information as to how. Thanks again. Hi Steven Thank you for your interesting article. one question. I want to know when EU take legal action against companies that violate GDPR? Does the EU have a plan to determine if the company is in accordance with GDPR? For example, is there a GDPR LAB or do GDPR compliance auditors review organizations? Or just wait for someone to file a complaint based on GDPR? Great question, Dara. I'm afraid I have no response though. Have you checked with your legal team on this? Thanks for the great article. Data mapping can really help companies in terms of data integrity. Keeping records of processing activities is also a good practice and it is covered by Art. 30.